Economic Rural Development Society (ERDS) is an organization that was established in 1982 in West Bengal. ERDS owes its existence to the dedication and hard work of Mr. Madhu Basu, who wanted to combat the growing poverty in villages and urban areas. It is a non-profit, secular and non-political organization dedicated to the mitigation of misery and poverty, and upliftment of the impoverished. The primary objective of the organization is to engage in sustainable development techniques to empower the local rural communities, especially women and children. In the initial years it concentrated on non-formal adult education. Gradually ERDS has diversified its activities in other fields such as women and child development, children’s education, health & nutrition, low cost sanitation, care & rehabilitation of the elderly and disaster relief & rehabilitation. Focus Area: Women Empowerment, Education, Health and Disaster Management. After years of providing community services, ERDS conducted an assessment of living standard improvements among its supported populations, and found the surprising news that there had been hardly any long-term improvements. ERDS discovered that their donations to supported communities had actually led to dependence rather than self-reliance. In a concerted effort to redirect this trend, ERDS turned to micro-credit with the financial support from IDRF. Pushing against cultural obstacles that make it difficult for rural women to work outside of the household, ERDS went ahead with mobilizing women into small groups, inviting them to gatherings where they were encouraged to speak up, and where their apprehensions were addressed. Since 2010, with the support of IDRF, ERDS’s micro-credit program has been educating women on how to effectively use their money, while also providing them with credit for small business ventures. This program has encouraged the development of women-owned small businesses, and also inculcated a practice of saving money. These training programs have been very successful, and over the years, the loan sizes have increased from INR 5,000 to 20,000, and it boasts of 99% repayment rates. As IDRF funding is in grant form, the repaid loans are used as revolving credit to make new loans. ERDS strictly monitors the activities on which the borrowed money is spent by regular visits to the family residences, and, thus, preventing the misuse of loans. The families are given advice on how to use the money for maximum gains, and businesses have steadily grown as a result. The program is co-financed by multiple sources, to best ensure its long-term sustainability. Due to the monitoring, training and 99% of repayment rates, over the years IDRF funds have become three-fold and have changed the lives of 2,000 families in 133 villages. IDRF’s funds are directed entirely toward the provision of these loans limited solely to rural areas and villages. ERDS is able to provide women with loans that was previously impossible to obtain due to the high cost of capital. Hundreds of women have received the technical skills, confidence, and financial expertise to operate extremely successful small businesses. Many of these women are now primary breadwinners in their households and leading more dignified lives. The general economic benefits seen by families has led these women to take good care of their children’s health and education. Chayarani Mondol belonged to a poverty stricken background and used to sell vegetables in the local market to meet both ends. Despite her hard efforts, the volatility in the prices of vegetables and increased competition in the market, made it very difficult for her family to survive on her meager income. Her children had to drop out of the school and could not continue their education. In 2009, she took the initiative and set up a small stationery shop with the seed capital support of INR 5,000 from ERDS. Chayarani made substantial efforts to increase the sales of her stationery shop and gradually the popularity of the shop increased. She gave up selling vegetables and started working full-time in her shop. She has been very regular in repaying the loan installments and with the financial support from IDRF, she has been extended a credit of INR 30,000. 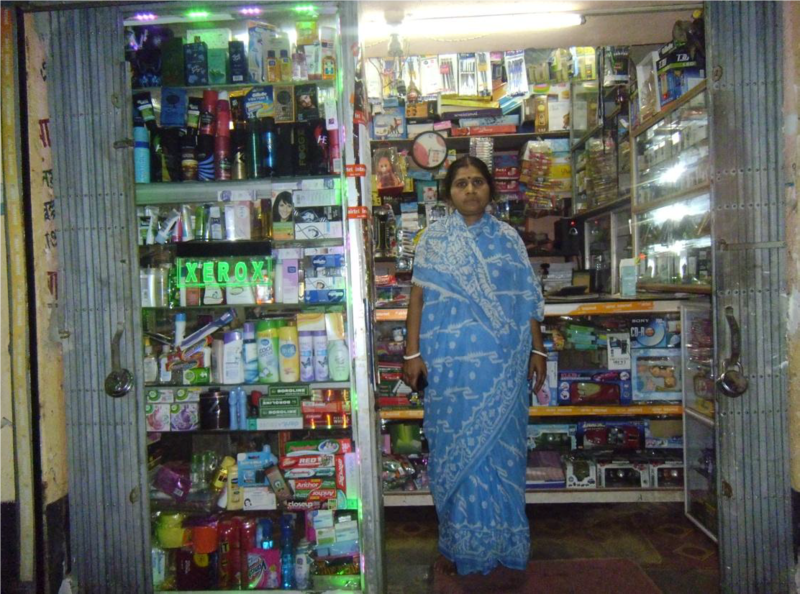 With this extended credit, she has been able to add daily use products and a photocopier machine in her shop. As a result of her hard work and support from IDRF, her family income has nearly trippled and their average monthly income is now INR 10,000. With this increase in her income she is now able to fund higher education for her daughter. Prior to joining IDRF and ERDS’ micro-credit program in 2010, Madhumati Saha’s garment workshop was making a loss in spite of her hard work. Through ERDS, she obtained a loan of INR 10,000 to buy an embroidery machine and raw materials. This initial investment paid off, and with the help of other loans through ERDS, she was able to expand the business to include hosiery products and children’s clothing. After successful repayment of her loans, she was able to borrow larger amounts that allowed her to rent a place to house the business and hire employees. She is now a thriving wholesale supplier of clothing products to various retail outlets in Kolkata. Her family income has improved significantly to INR 25,000 ‐30,000 per month. “We are now capable enough to fulfill the basic needs of the family like education, nutrition, and health. 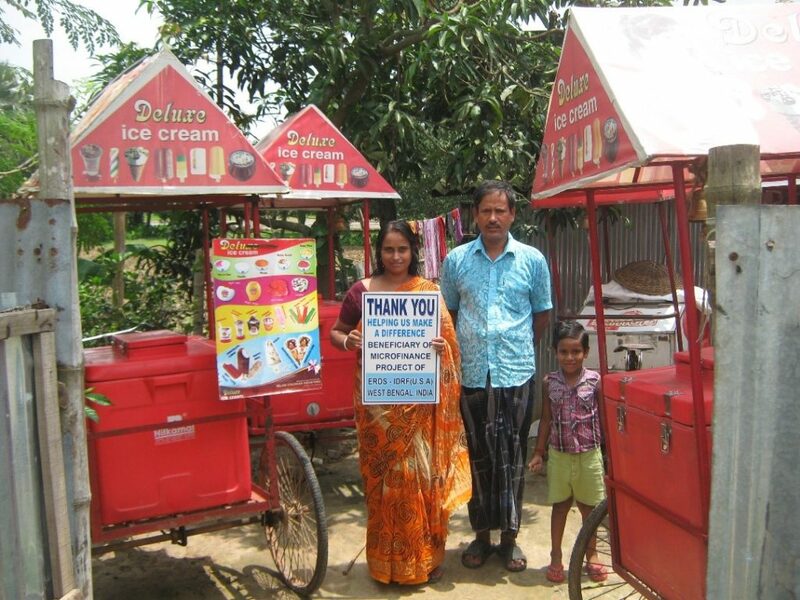 We consider ourselves blessed to be members of this micro-credit program”, says Madhumati Saha, beaming with pride.